t*rexes and tiaras: Tuesday Titles 060..
OK, I did it. I left my current book at home when I stayed at Alex's last weekend so I picked up Fangirl from her bookshelf. I wasn't so sure about reading this, as I didn't seem to enjoy the previous Rainbow Rowell books as much as other people have (I guess I didn't really *get* Eleanor and Park). 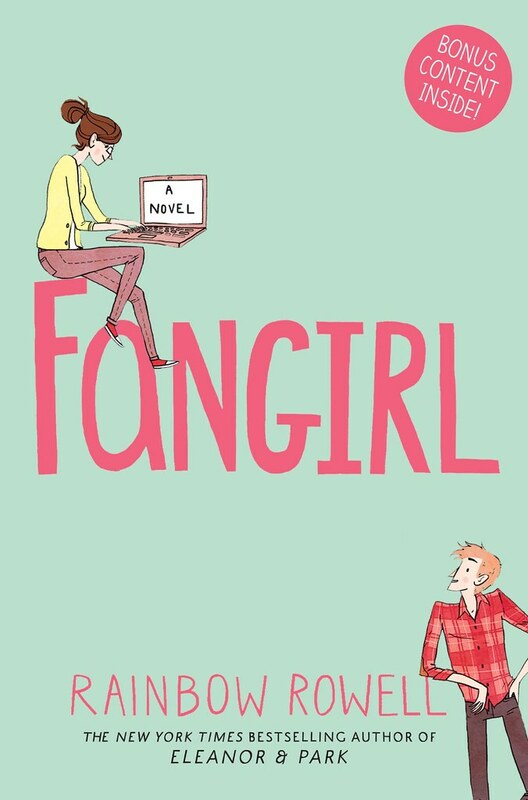 I'm not sure whether I was just feeling more as though I needed a fairly light and fluffy read, or what, but once I got going with Fangirl I finished it within the day. I enjoyed it more than I recall enjoying my previous Rowell reads. Twins Cath and Wren are off to college. Having spent most of their lives thus far doing everything together, Wren wants to put some space between them. She'd rather not share rooms, and Cath feels as though she's being left behind. The premise is quite relateable to just about anyone off to face university or college for the first time, I think. You're not necessarily going to grow up and find your place at the same speed or in the same was as everyone else, and I guess Fangirl works to remind people that this is OK. Throughout the book there are references to a Simon Snow series (similar to Harry Potter, I think) which the twins have spent years writing fan fiction for. I've heard that one of Rowell's upcoming books is to be a Simon Snow one. Unsure about that one. Have you read Fangirl? If so, I'd love to know what you thought. I read Fangirl a few weeks ago, and absolutely loved it because how relatable it was, and how realistic the characters were. I didn't really like all the Simon Snow snippets though, they didn't really do anything for me. I couldn't get in to them and I found myself skipping over them most of the time. The Simon Snow book might actually be better because I imagine it will be told in chronological order, which the snippets in Fangirl weren't which made it really hard for me to get into. That's true - by the end of the book I was only skim-reading the Simon Snow stuff as it wasn't really interesting me. I keep meaning to pick up some of Powell's work because I keep hearing so much about it, maybe I'll have to start with this one! I'd say this is the best of the ones I've read (Fangirl, Eleanor and Park and Attachments). I absolutely LOVED Fangirl but urgh, the Simon Snow bits were insufferable. I'm sort of dreading her new book, which is entirely Simon Snow. I really, really hope it's better than the stuff in Fangirl. I think it's supposed to be *the* story Cath was writing. I'm not sure I'll be bothering with it. I haven't read this but I'll definitely keep it in mind for when I want something light!